"Killer coding ninja monkeys do exist." Thanks to Andrew Hall for the shirt. If Ninja == Vi, then I'm a Ninja. Is that a pirate gang sign? > If Ninja == Vi, then I'm a Ninja. > Is that a pirate gang sign? sheesh. good thing i started growing a beard. 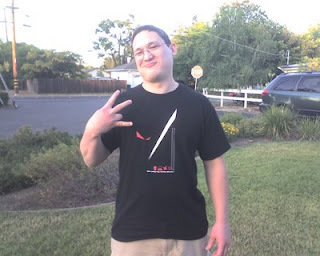 That is a sweet vim gang sign. I am going to have to start throwing that at work to those emacs flunkies. Keep flashing that around and you are going to have an Emacs drive-by on your hands. Ah, I see it now. I thought maybe it was an E.
> Keep flashing that around and you are going to have an Emacs drive-by on your hands. I'm not worried. Do you know how hard it is for an Emacs guy to pull the trigger? It's gotta be C-x C-t or something like that! The only thing that could make the photo cooler would be replacing the station wagon in the background with a minivan. BTW, you are a ninja.